As growth of Yahoo-owned Tumblr continues unabated, new features are being added to the official iOS app on a regular basis. 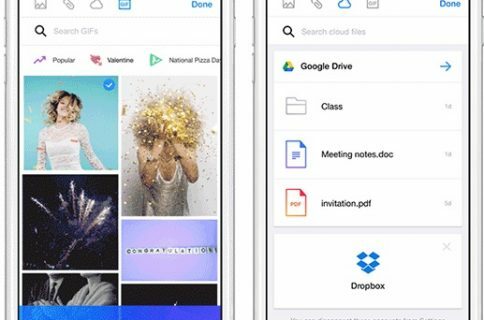 After picking up support for two-factor authentication last October, the new Tumblr 3.8 for iOS now includes greatly improved integration with the popular 1Password password-management app, as well as with Authy, a handy iPhone software for generating two-factor codes. Coincidentally, 1Password has just gained a handy one-time password tool which supports 2-step verification for popular web services, including Tumblr. So if you’re a 1Password user and have enabled two-step verification in your Tumblr account, you’ll be able to log in to Tumblr on mobile faster than ever. Next, Tumblr’s Push Notifications have been expanded and now include additional events such as asks, answers and fan mail. You will also get alerts on your Lock screen for posts or follows that can be swiped to like a story or follow someone. Notifications: Now for asks, answers, and fan mail. Yes, finally. Lock Screen: Swipe your notifications to like posts or follow people. Passwords: Greatly improved integration with 1Password and Authy, for those who bother to log out. Accessibility: Tumblr was already for everyone but now it is even more so. Storage: App taking up too much space? Smash the cache. Just feel like smashing something? The cache is a relatively harmless thing to smash. Loveliness: Some subtle tailoring, for the connoisseur. The 25.3-megabyte app require iOS 7.1 or later. Out of the 574 million mobile active monthly users on Yahoo, 463 million were on Tumblr as of last month. The blogging-platform — which Yahoo CEO Marissa Mayer purchased in May 2013 for $1.1 billion, much to the dismay of shareholders — overtook Facebook-owned Instagram as the fastest-growing social network in the holiday quarter. 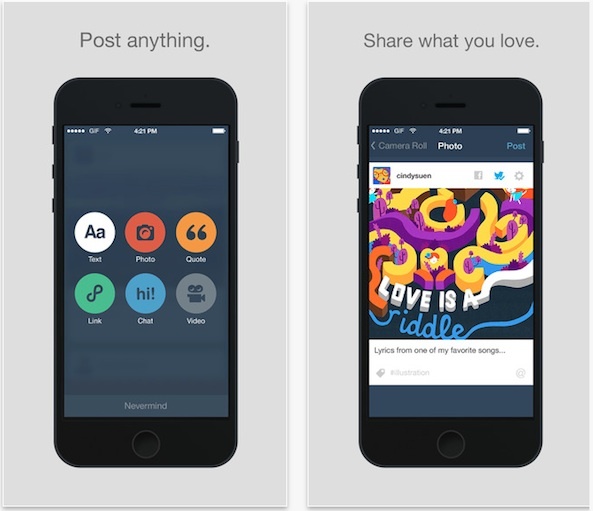 Download Tumblr free in the App Store.